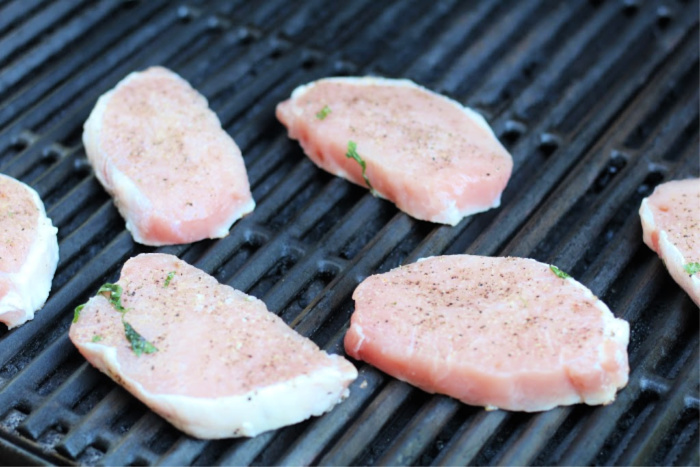 This recipe for how to grill the perfect pork chops has been sponsored by the Ohio Pork Board. All opinions listed are 100% my own. Even though we are just a couple of weeks into fall, my grill has still been working overtime around here! The south is known for its humid fall weather. In fact, we are pushing close to 86 degrees just about every single day, and because of that, I still have my grill fired up. I am just not quite ready to give it up just yet. One of my favorite cuts of meat to grill are pork chops. However, if you don’t do it just right, you can quickly overcook them and cause them to dry out. 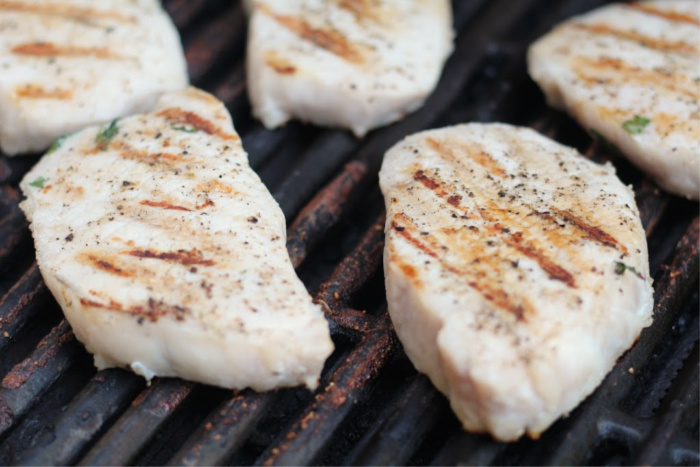 Today, I am going to teach you my secret weapon on how to grill the perfect pork chops. 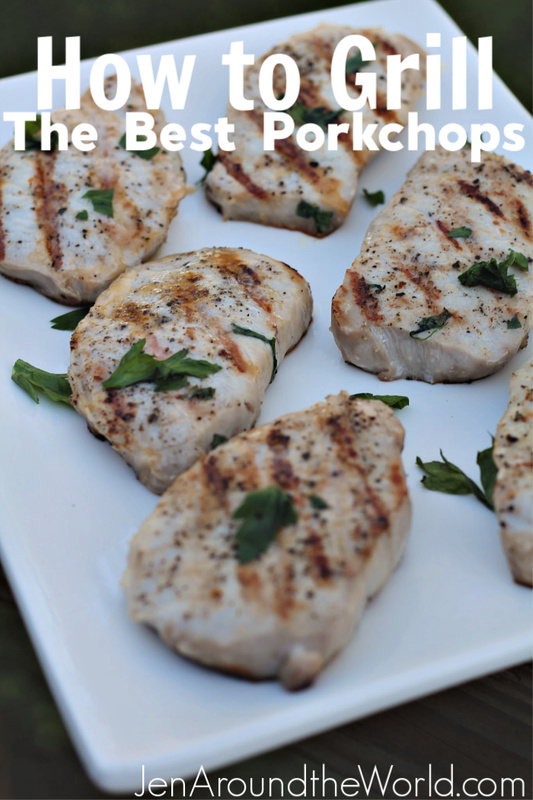 Do you want to know what the secret is to grilling the perfect pork chop? You know the kind that when you cut into it, it has so much juice running through it that each bite is full of moist, juicy flavor? It’s simple — brine those babies! But of course, you have to start with premium pork. 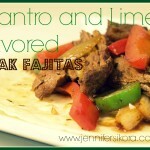 As you may remember, I told you awhile back how much I love cooking with pork! My favorite cut is boneless center cut pork chops, but you can use bone in, end cut — whatever you like. 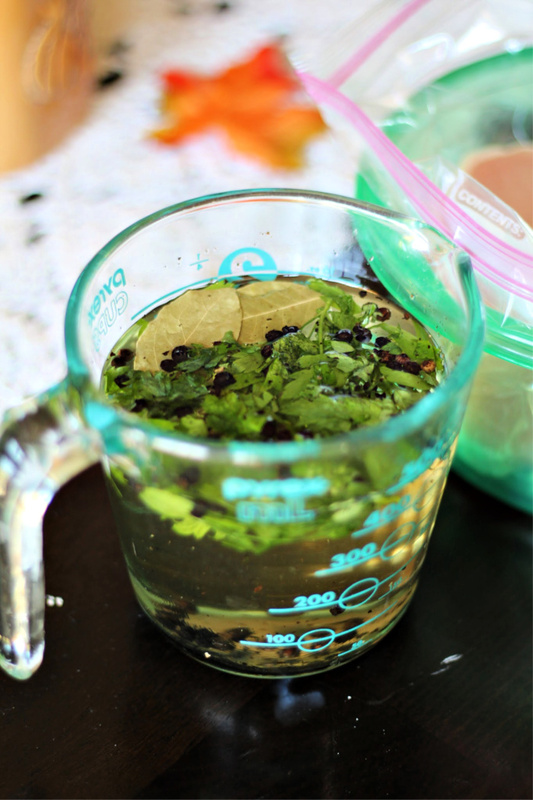 Now, you are going to mix up your brine in a ziplock back. You will place the bag in a plastic bowl to kind of give it some stability so that your pork can rest in the brine juices. Brining sounds really intimidating, but it’s just a mixture of sugar and salt water that your chops set in. They act like a sponge, soaking up extra flavor and juiciness so that when they cook, everything gets grilled inside. This makes for an extra juicy pork chop! All you will do is mix together the water, salt, and sugar and let the hot water melt the sugar and salt. Then add in all your other herbs and spices and mix together. Let the liquid cool down before using it. You can add ice to the bag to cool it down instantly. Now, place all your chops into the ziplock bag and add in your brine. Let it rest for about 30 minutes to an hour. After that time, remove from the brine, season with salt and pepper and throw them on the grill. 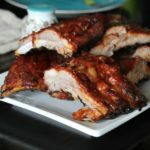 The reason that I am SO in love with using pork these days is that I found out that a 3 ounce serving of pork such as a tenderloin, for example, is an “excellent” source of protein, thiamin, vitamin B6, phosphorus and niacin, and a “good” source of potassium, riboflavin and zinc, yet contributes only 6% of calories to a 2,000 calorie diet. 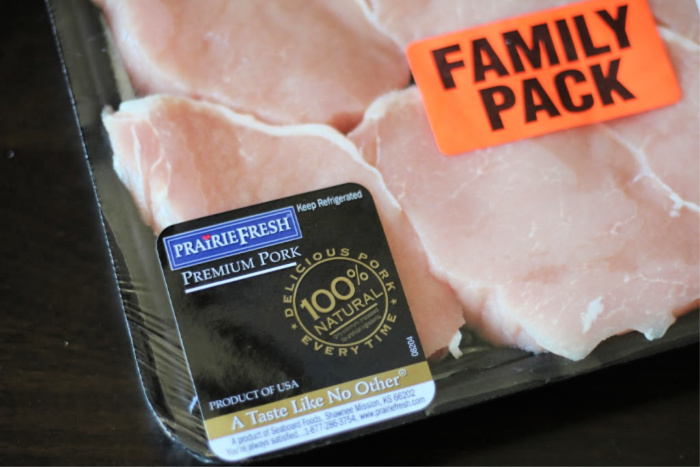 Fresh pork is naturally low in sodium. 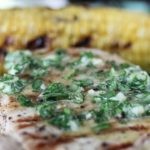 There are some steps to take when grilling pork chops that will ensure you make flavorful and juicy pork chops every single time. If you want a really juicy pork chop, you need to make sure and sear your chops really good on both sides. This means that when your chop is on the grill — don’t mess with it! If it does not come off easily when you try to turn it, that means it is not ready yet and you need to leave it alone! Get a good sear on it and what that does is trap the juices inside instead of oozing out while they are cooking. Another thing is the temperature of the meat. Now long ago, people said you need to cook pork chops to the temperature of 165-170. Y’all — that meal will be dry as dust if you do that! According to Food Network, pork should be cooked to an internal temperature of 145-150 degrees for the ultimate tasting porkchop — and I tend to agree with them. So — get you a meat thermometer — because you cannot read minds. Once the meat has reached the perfect temperature — pull it off the grill. And this brings me to the final tip for grilling the perfect pork chops. You need to let your meat rest once you pull it off the grill. A good resting time is about 15 minutes. You don’t want the meat so hot you can’t eat it anyway. This gives those juices time to redistribute through the chops making your meat moist and flavorful. If you cut into them right as they come off the grill, all those beautiful juices you worked so hard to sear inside the meat, will come running out onto your plate. When you’re done, you will have pork chops that are out of this world! 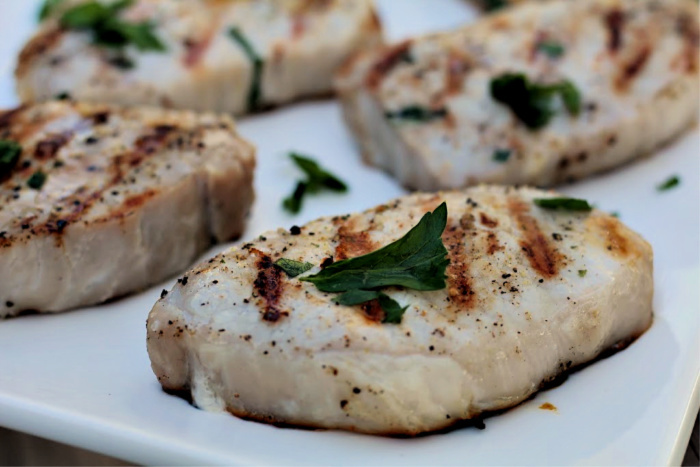 This recipe will show you how simple and easy it is to make perfect grilled pork chops every single time! To make the brine, combine water, salt, sugar, garlic, and peppercorns in a medium saucepan over medium heat. Stir until salt and sugar have dissolved completely. Remove from the heat and let cool. Add the parsley. 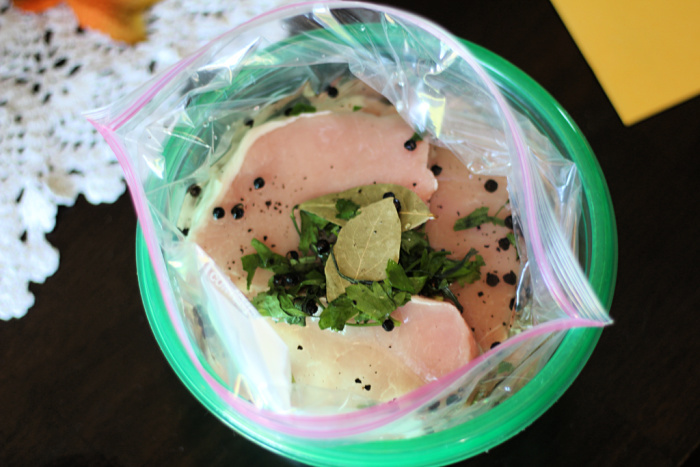 Once the brine has cooled, place the pork chops in a gallon size zip-top bag or sealable container and pour the brine over them. Seal and refrigerate for 30 minutes up to overnight. When ready to grill, heat the grill to medium-high heat. Remove the pork chops from the brine. Discard the brine. Pat the pork chops dry with paper towels. 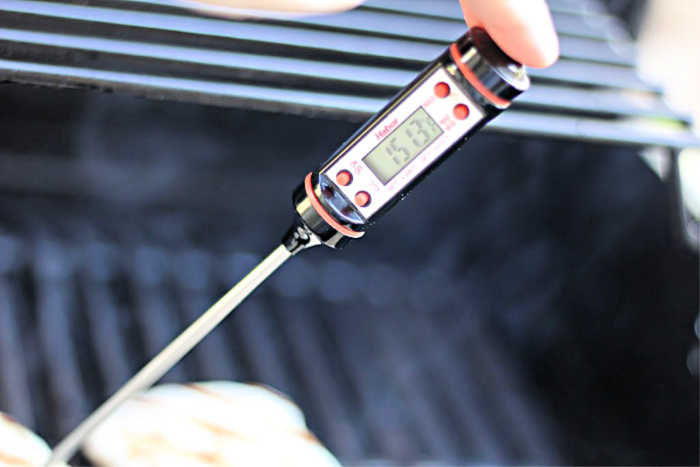 Grill 4 to 5 minutes on each side or until a meat thermometer reads between 145°F and 155°F. Remove from the grill and allow the chops to rest for about 15 minutes before serving. 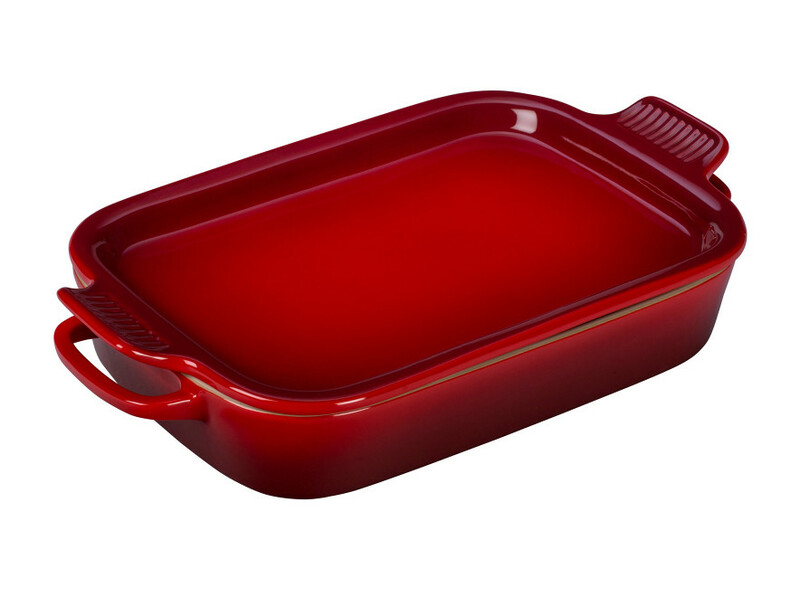 One lucky reader is going to win this adorable Le Creuset baking dish. I am not the cook in our house but those pork chops look amazing and so moist. Your ideas for cooking temperature and resting after cooking are so smart and it shows with the result. Brining is always a good bet to make any meat tender and flavorful. That’ a great giveaway, too! 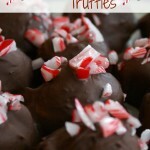 I’m going to have to make some of these soon. They sound really nice with that brine! I’ve always struggled to grill pork chops. This will help tremendously. My best grilling tip is to experiment with grilling fruits and veggies. 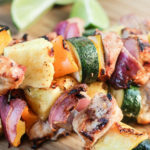 I’ve been pleasantly surprised at how tasty fruit and veggies are on the grill! I usually wrap them in foil! My husband is the one who grills in our home so I don’t know much about grilling. One thing I do know is that if you marinate meat beforehand (at least a few hours), it won’t dry out as bad and will be juicier when it’s done cooking. I have some pork chops in the freezer right now. I think I’ll try your method and recipe tomorrow night! 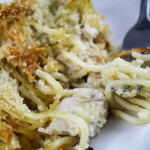 Love the peppercorn addition in the recipe! We struggle with pork chops and ensuring they are done and not overcooked! Thanks for this recipe, I’ll give it a go! 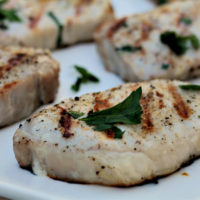 These pork chops look delicious. I love the idea of grilling them and love your ideas. Ours are always tough. Start with a super hot grill to sear, then reduce heat. Moisture stays in and meat cooks evenly. Ohhh I’ve never tried brining them. What a great idea. And Le Creuset is my favorite! Ugh there is nothing as unpleasant as overcooked dry pork, except possibly undercooked pork. Hubby loves pork, particularly when I make him stuffed pork chops. I really have no tips for grilling other than to oil a paper towel and use tongs to rub on the grill. I haven’t tried using a brine with pork chops before. My husband does have a habit of overcooking them. I will give this a try. I always focus on prepping all the sides and salads before grilling to ensure that grilling is relaxing and that it gets the focus it deserves. Going for thicker chops makes perfect sense. I haven’t had much chance to grill pork chops, so this is really helpful. By the way, the advice on going thinner for frying is 100% accurate! I need to try this. My chops always come out too dry. I tend to grill with foil packets. Keeps the moisture in. Every time we fire up the grill we throw some rope sausage on and slather them in barbecue sauce. 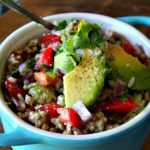 Those are already cooked, so they are done much sooner, so we can pull those off, wrap them in tortillas, and serve them as appetizers. Make sure the grill is really hot before putting your steaks on it, to get a good sear. I marinate my chicken over night in a zip lock bag. I also do my veggies that way. I have a special basket to use on the grill for my veggies and shrimp. I’m looking forward to trying this. My chops are always tough and dry. I like to marinate at least 4 hours and allow the grill to warm up well before starting. Make sure the grill is not too hot and watch carefully. 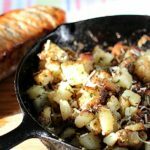 My tip is to use a grill pan for smaller veggies and meat. I like to grill over charcoal. Tip: Make sure it is white all over the top before puttihg the meat on the grill. Also, I like to leave vents on both sides of the grill open so there is good air flow over the coals and food. My grilling tip is to not flip or move the meat around, and only flip once. If you try to flip or move the meat too soon, it will likely stick. Thanks for such a great giveaway.